The plan was set, we would now head to the Northern Alps and up to the Portes Du Soleil to race the first round of the French Enduro series in Samoens. 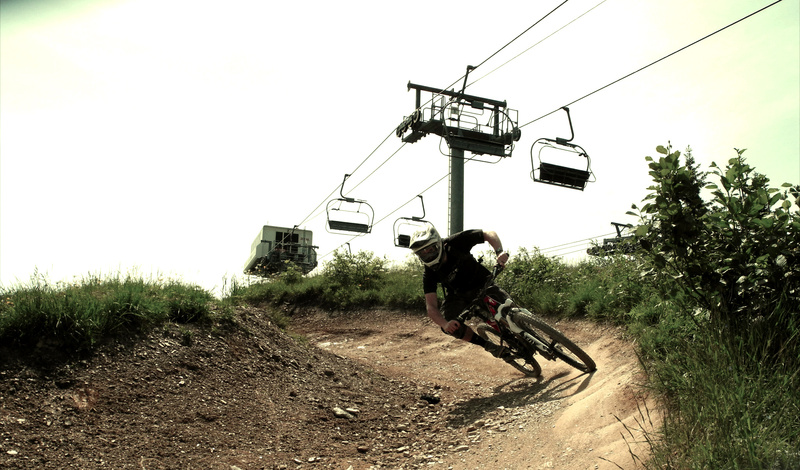 If you didn’t already know, the Portes Du Soleil is a very popular destination with British mountain bikers due to its close proximity to Geneva and its huge amount of mountain bike terrain. After the best part of a day’s driving in a hot and sweaty van we pulled into Les Gets pretty tired. The next two days were spent decorating to earn our keep, but we did manage to escape each afternoon for a few sneaky laps. 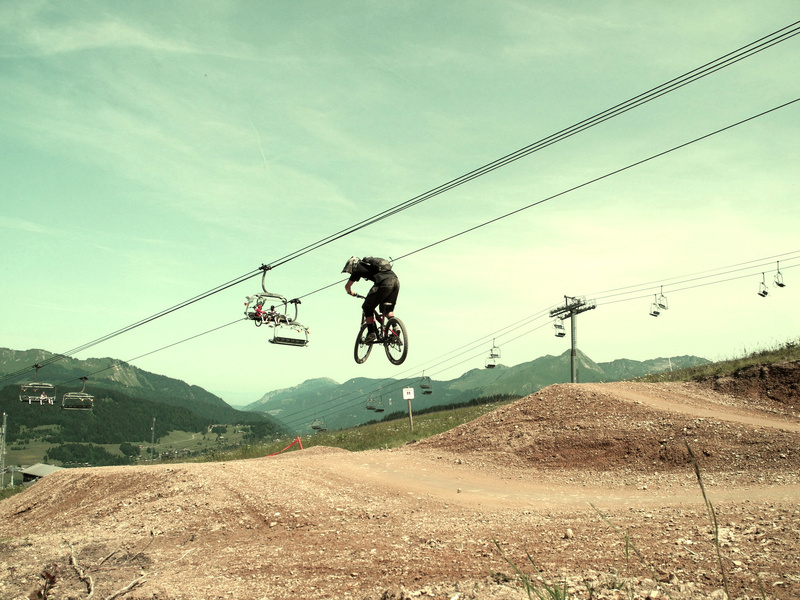 As it was so early in the season only the Les Gets and Morzine lifts were open. This reduced our riding potential greatly, especially as the Pleney lift was broken, but we had a good couple of days around Les Gets riding singletrack and trying to keep off the main trails. In Les Gets the main track runs below the Chavannes Express and was built years ago, but it seems that maintenance has been non-existent since then. In fact, this seems to be the story with a lot of the specific bike tracks in the valley. It really seems a shame as the riding potential out here is mind blowing and all the infrastructure is in place but it seems to be lacking a clear vision, along with track builders and a specific trail maintenance crew. Having said that we were still having a great time! The Nukeproof Mega was holding up really well and I was loving it more and more each day. It really is an amazing bike for the money and it is totally at home in the mountains. All too quickly the weekend was upon us with the first round of the French national enduro series in Samoens, just 20km down the road in the next valley. Thursday night the heavens opened and the rain came down in true monsoon style; it was going to be and interesting weekend. Being used to racing gravity enduros in the UK we naively rocked up Friday morning ready to practice and the place was dead. It turns out, in true French enduro style, there is no practice; just straight into your race runs on Saturday morning. There was an option to walk the tracks, but with up to 1100m of vertical descent and no lift access, we passed and opted to hang out in Samoens waiting for sign-in and tried to suss put how this race was going to work. It turned that on Saturday we would ride the first track twice, the second track twice and the third track once, so nearly 4000m of vertical. On the Sunday we would ride the same track four time, making nearly 4500m of vertical. All the tracks were lift-assisted with short pedal liaisons of up to 25-minutes, but still we had a monster weekend ahead of us. Time for a big pasta dinner and an early night. Saturday 7:30: Race day and we were pumped and ready to get going, but straight away we were in trouble. We were told we were not allowed to race, as we did not have the required spine-protectors or elbow pads. Luckily we had them back in the van, so we could still race, but it’s worth bearing in mind that racing in France requires a full-face, knee, elbow pads and a spine board. It’s very different to the UK enduro racing, but as we were to find out this type of enduro racing is at another level! The first 25 riders are seeded from their previous season’s results, then after that you queue up and go when you’re ready. Our first couple of runs were like a war zone on freshly cut trail with wet, greasy, steep, rooty terrain and bodies and bikes all over the place. We were catching people and getting caught. It was wild, and stupidly we had not opted for mud tyres. It turned out to be a real steep learning curve, but by the afternoon we were starting to get the hang of it and even had time to swap tyres for a spike on the front. The secret was to get going as quickly after the seeded riders as possible to try and secure a clean run. As the afternoon went on our times were getting quicker and we were moving up in the positions. Sunday’s track didn’t disappoint either, and as the day went on it got more and more cut in and faster and faster. What a brilliant weekend’s riding with just over two hours of full-on descents. No wonder the Frenchie’s seem to dominate enduro racing at the moment with a national series like this.